I excitedly await the full release of the scans for this! Thank you so much for holding the Group Buy and for this here scanning. I should have gone for that instead of getting scammed. Oh wow. This came out of nowhere for me. Family photo with all but 2 of my SKCC boards: https://i.imgur.com/uGeUGd4.jpg I still want to get a Nabu and Morrows SKCC board so maybe in the future I can retake this with even more boards. Wow, you've got a lot of SKCCs! Do you think they are as susceptible to dust and wear as the SKCL/SKCM line? I'd be on that 5140 in a heartbeat if it weren't for my recent purchases. Writing is easy. All you do is sit down at a typewriter computer and open a vein. 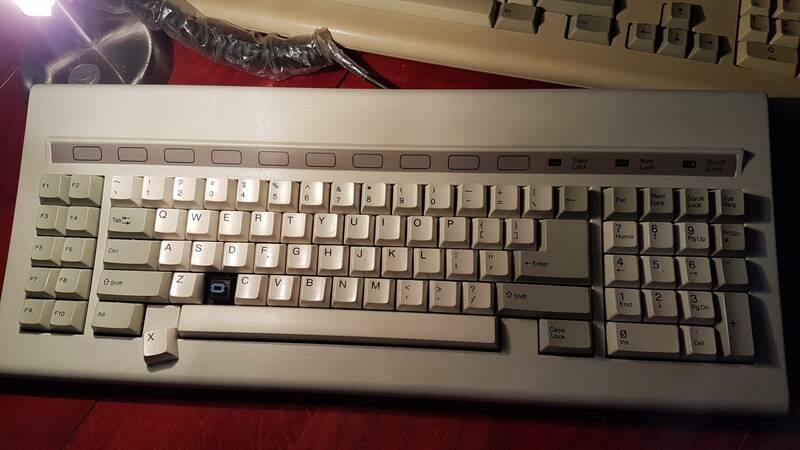 Glory be to the superior Model F! I might have a couple from wheelwriters. Give me a few hours to get home and check. Also, is that branding on the bottom of the switch in your last picture? Here's some pictures of the orange switch keyboard. Sorry if this posts twice, some wacky thing happened. Could this be an Omron B3G-S clone? Fischer Price Omrons, that's something you don't see every day. It sounds like raindrops reverberating in a cave after dropping on a particularly thick bucket! Will do, it might be a few days though. That particular seller seems to have some interesting stuff. Yes, that seller has had some very neato beans things in their storage. I ended up getting a nice SMK board from them. But hey, we got it! I look forward to seeing how these things are. As a wild guess, maybe $350-400. But that is just a guess and not based on evidence. I say keep being iMav. You've still got a legacy even if it ended on shakey grounds, and so your word still carries cred in the community. Aww, matt3o! At least make them post in the proper subforum! Now we need to try pine vs bamboo. Maybe they changed materials when removing the slits?